Pregame: ESPN’s Fran Fraschilla sets up the raucous atmosphere by telling us, “Everyone we’ve met in the last 24 hours has been talking about this game.” You mean, it’s trumped all the other things you’d talk about if you were in Turkey? Guys you’d know on Turkey’s team: Hedo Turkoglu, Ersan Ilyasova … and we’re done. 9:25: Derrick Rose drives the lane for a spinning layup. The single smartest thing Coach K did: dumping Rajon Rondo before the tournament started. This team could only succeed because of the “young/energetic/undersized athletes rallying around Durant and having good chemistry” dynamic and it wouldn’t have worked with Rose and Rondo (natural rivals) competing for minutes. Rondo was expendable for two reasons: can’t shoot from outside (neither can Rose), can’t shoot free throws (Rose can). And you didn’t need both. The good news: Every Rose/Rondo game is going to be A-W-E-S-O-M-E this season. Here’s our 2012 Olympic starting lineup if everyone stays healthy: Dwight Howard, Durant, LeBron James, either Chris Paul or Deron Williams, and either Dwyane Wade or Kobe Bryant. From what we just witnessed from Durant these past two weeks, he now has the best international scoring package of any American player since Jordan. (And he’s a great patriot, as he proved by smartly writing “1972” on his sneakers before Thursday’s Russia game, and then “09/11/01” on his shoes for Saturday’s game.) Actually, here’s your ideal international scorer: A 6-foot-10 forward who can shoot over everyone, make 3s like they’re free throws, post up smaller players, run the floor and play multiple positions. That’s Durant. He should be the crunch-time guy on that 2012 team no matter who the other guys are. Will everyone else agree? Digging deeper: 2012 will be the first time since 1992 that we had this many mega-stars in their primes or near-primes — LeBron, Wade, Howard, Durant, Paul, Williams, Carmelo Anthony — all of whom will also be battling for NBA titles in 2011 and 2012 (throw Kobe in there as well). Can they shut off that competitive switch and come together on short notice? What if Durant fully supplants LeBron and Kobe as America’s basketball darling by that time? What if Miami just battled Oklahoma City in an NBA Finals bloodbath? In 1992, the pecking order was pretty established: Jordan and Pippen were the champs/alpha dogs, Bird and Magic were the washed-up leaders, Barkley was the unstoppable wild card, and everyone else fell into place behind them. There will be no established pecking order in 2012. If anything, there might be multiple stars who believe in a pecking order that’s different from what the other stars believe. Verrrrrrrrrrrrrrrry interesting. Hold this thought for 22 months. 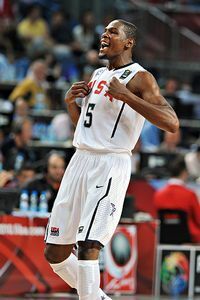 8:25: Durant nails a stepback 3 (7-3, USA.) He had 33 in the quarters, 38 in the semis (and Lithuania went box-and-one in the second half to rein him in), and now, five in two minutes. After a Turkey score, Andre Iguodala tips in a Rose miss. One of the frustrating things about this tournament: Iguodala has been a revelation as a fourth banana/swing defender/energy guy/uber-athlete, which really should have been his NBA destiny — mega-glue guy on a great team, like a much more devastating version of Trevor Ariza on the 2008-09 Lakers — only we don’t have nearly enough quality players to fill 30 NBA teams, so instead he’s forced to carry a lottery team, take terrible shots, play with inferior teammates and do everything that the basketball gods never meant for him to do. He’s like Roger Sterling in “Mad Men” — you don’t want him carrying the show, but in short doses, harnessed correctly, he can be a weapon. I had given up on Iguodala as a meaningful basketball player; now I think he’ll be reincarnated on a contender within the next two seasons. He’s one trade away. 7:15: Durant for 3 (USA up by five). He just passed Ticky Burden as the all-time U.S. scorer in a world championship, which might be the most random thing that’s ever happened. (He also co-owns the single-game record with 38 points.) Fraschilla says that if you were drafting a team from scratch and could have any guy for the next 10 years, Durant would be his pick. And mine as well. So there. 6:09: Odom has to leave because he has a bloody nose. Team USA’s trainer treats it with latex gloves and an “Uh-oh, isn’t this the guy that married a Kardashian?” look on his face. Highlight of the game so far. • Vote: Who makes 2012 squad?